The Ram Mandir-Babri Masjid title dispute case, the Sebi-Sahara payment row, the Aadhaar privacy issue and the Cauvery water dispute are only some of the legal puzzles he will have to deal with. 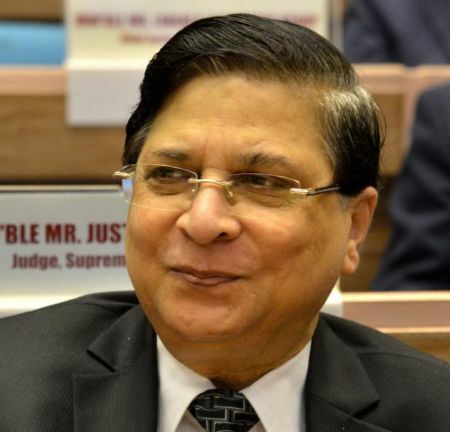 Justice Dipak Misra is all set to take the helm of the judiciary as the 45th Chief Justice of India. His appointment follows a long-standing tradition of picking the senior-most judge for the post, and comes after a recommendation by outgoing Chief Justice Jagdish Singh Khehar who retired on August 27. Considered by many as a hardline jurist, Justice Misra was part of the bench which, in an unprecedented pre-dawn hearing in July 2015, rejected Mumbai blasts convict Yakub Memon's last minute plea to escape the hangman's noose. Similar was the fate of the four men who gang-raped and murdered a young medical student in what came to be known as the Nirbhaya case. Justice Misra led the Supreme Court bench that confirmed the death sentence of the four convicts. Justice Misra is credited with contributing to police reforms through delivery of a verdict in Own Motion vs State, wherein the court directed law enforcement authorities to upload FIRs on the official Web site within 24 hours of their filing to allow the accused to take appropriate and timely recourse to available remedies. He was also part of a bench that upheld an Allahabad high court judgment striking down reservations in the promotion of government officials. Born on October 3, 1953, Justice Misra enrolled as an advocate in February 1977. He practised Constitutional, civil, criminal, revenue, service and sales tax law in the Orissa high court and other tribunals till his elevation as an additional judge of the high court in January 1996. He was transferred from the Orissa high court to the Madhya Pradesh high court in March 1997, and became a permanent judge of the court in December of the same year. In May 2010, Justice Misra became the chief justice of the Delhi high court. Recognised for the swift disposal of over 5,000 cases and the success of the mediation centre in the high court during his tenure, Justice Misra was elevated to the Supreme Court in October 2011, where he soon developed a reputation for being one of the most eloquent judges of the court. After an almost six-year tenure as an apex court judge, he is now set to assume the role of the Chief Justice of India for 13 months, till his retirement on October 2, 2018. Justice Misra will become the third Chief Justice of India to hail from Odisha, after Justice Ranganath Misra and Justice G B Pattanaik. While many of his judgments have been lauded by nationalist organisations, other legal luminaries have been critical of his orthodox approach. His critics say he has expanded and elevated the scope of the 'reasonable restrictions' to Fundamental Rights under the Constitution to the detriment of citizens. One such judgment delivered by Justice Misra was in the Devkidas Ramchandra Tuljapurkar vs State of Maharashtra case. He is said to have promoted unreasonable restrictions to freedom of expression by upholding a conviction under Section 292 of the Indian Penal Code (sale of obscene books etc). The decision criminalised the use of offensive language to describe 'historically respected personalities', even though neither the Constitution nor the law gave an elevated status to such figures. The verdict has been held by critics as mandating people to accept the 'respectability' of Mahatma Gandhi and other such personalities in violation of personal freedoms. A verdict that upheld the Constitutional validity of the over 150-year-old criminal defamation law (Section 499 of the Indian Penal Code) met with a similar fate. The judgment, which held that a 'person's reputation could not be allowed to be crucified at the altar of another's freedom of speech', has been criticised by some and seen as a violation of the Fundamental Rights enshrined in the Constitution. His decision in the 2016 Supreme Court National Anthem case and the framing of guidelines, which include the mandatory playing of the anthem in movie halls and restrictions on its monetisation, has also drawn criticism from many. Grave apprehensions over his selection as Chief Justice have been raised by several personalities, including senior lawyers of the Supreme Court, due to a controversy surrounding an old land allotment matter now pending before the Orissa high court. Given the allegations of impropriety against him, Harinder Singh Khalsa, a member of Parliament from Punjab, has filed a petition in the Delhi high court challenging his appointment as the Chief Justice of the country. Controversies aside, Justice Misra's term as Chief Justice will undoubtedly be focused on several high profile matters, which he will have to carefully consider. The Ayodhya-Ram Mandir-Babri Masjid title dispute case, the Sebi-Sahara payment row, the Aadhaar privacy issue and the Cauvery water dispute are only some of the legal puzzles he will have to deal with. Justice for all or just another jumla?